If there is one common theme that I have heard in conversations with senior bank executives over the past several months, it is that their fundamental business model is under siege. They are uncertain about [blah blah blah]. These uncertainties have severely hampered banking executives’ ability to plan how to run their businesses or even know what their businesses may include. Predictably, bankers are reacting to this unprecedented uncertainty by becoming conservative and cautious. The result is that there is less lending and less credit available. ….It is important to remember that a variety of actors helped create the financial crisis….Regulators permitted dramatic increases in leverage at investment banks, and billions of dollars of debt stayed off some banks’ balance sheets. There was failure at virtually every level of regulatory oversight, including, critically, minimal controls over mortgage brokers, who encouraged many subprime borrowers to contract for houses or take out additional loans that they could never afford. Doesn’t it sound like a burglar complaining a robbery was not his fault because the cops weren’t watching the house closely enough? Schwarzman seems to forget that regulators permitted these bad actions in response to financial sector lobbying — it’s not like the regulators just up and announced absurd leverage requirements without outside pressure. Yep. Financiers will do whatever the law allows them to. And they’ll always push to make the laws as friendly as possible. That’s just human nature and it’s not going to change. Which is exactly why Congress ought to start ignoring them and begin passing laws to rein them in, just like Stephen Schwarzman apparently thinks they should. After all, if you want to cut down on speeding, you don’t just sit around complaining about how reckless people are. You pass a law against speeding and then staff up the highway patrol. 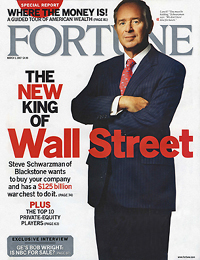 POSTSCRIPT: By the way, Schwarzman’s op-ed is actually even more damning than Tim suggests. Schwarzman’s point isn’t just that there was regulatory failure, his point is that there were huge failures everywhere in the financial industry. He’s right! But far from exonerating bankers, it’s exactly why regulatory reform ought to be broad and sweeping. His op-ed is an argument for regulating bankers and everyone else too.